The Cambodia Water Festival is one of the most important and festive celebrations in the country. Brightly painted pirogues (canoes), flocks of boatmen wearing colorful uniforms, spectators dotted along the famous Sisowath Quay, food stalls selling all kinds of local street food fills the city with a general air of merriment. 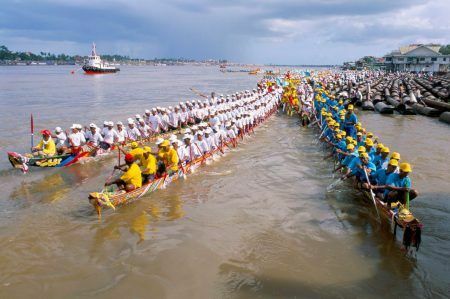 This 3-day affair is a must see for expatriates and tourists alike, with the highlight being the epic boat racing events in Phnom Penh. Bon Om Touk is an annual event being celebrated by Cambodians for centuries. It marks the end of the rainy season, welcoming the Harvest Moon and the start of the harvest season. The event coincides with the rising of the full moon, believed to be the “rebirth” of the country through the monsoon rains, on the 12th day of Katdeut – the 11th month of the Khmer Buddhist Calendar. The Cambodia Water Festival is symbolic of many different occurrences in the history of Cambodia. The first boat racing event is dated as early as the 12th century in honor of King Jayavarman VII and his marine army who defeated the Cham people, the Southeast Asian Muslim ethnic group that had occupied Angkor in 1177. It also served as a venue for the annual naval exercises showcasing the prowess of the Cambodian Navy in Tonle Sap Lake. This tradition is depicted on the 800-year-old engravings in the Ankor Temple and the stonework at Bayon (near Siem Reap) and Banteay Chhmar (near the Thai border) featuring boats similar to the fleets that race on Tonle Sap today. Another belief is that the Cambodia Water Festival is a celebration of the Seven-Headed snake. 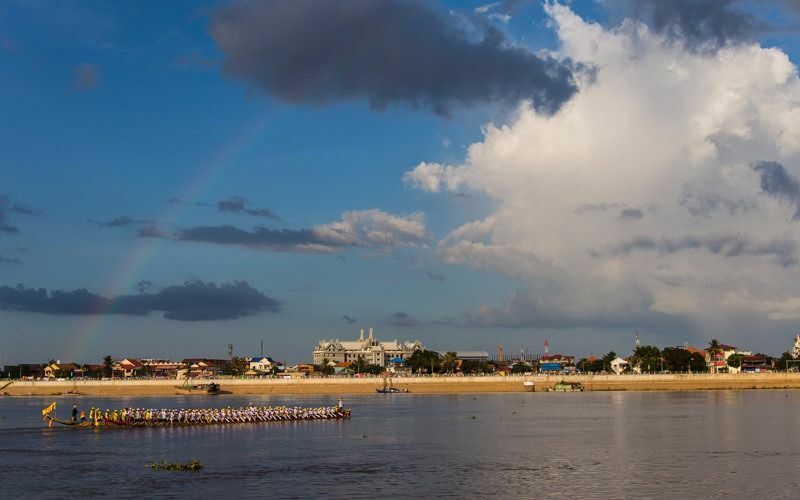 Legends say that the festival is a tribute to the Buddhist teeth of a nāga, whose daughter married an Indian prince and established the Kingdom of Cambodia, which became lost in the depths of Tonle Sap when he was cremated. Nāga is a Sanskrit word meaning “snake” or “serpent” and usually refers to the King Cobra. Before the Bon Om Touk, men in pagodas near the river prepare for the festivities by restoring canoes that had been used in the races for hundreds of years, or create new ones that they can use to compete. Canoes, sometimes called pirogues, are made from the trunk of the coki tree, which is resistant from rotting. Each boat is designed with a pattern symbolizing the guardian goddess and eyes at the prow, to protect against evil. This is a modification of the superstitious tradition of nailing actual eyes to the boat dating back before Buddhism. In the morning after the completion or restoration of the racing boats and after three shouts of the crews, the canoes are then pushed into the river to head to the capital before the full moon. The best crews are chosen and being a member of the team to compete in the capital is an extremely high honor. If the team wins, this brings good luck to the families of the participants for the entire year. The Cambodia Water Festival is also a celebration of a major natural phenomenon that only happens in this side of the world – the reversing water flow between the Tonle Sap and the great Mekong River. It is a special tribute of Cambodians to the great river that have given them so much. Tonle Sap – meaning tunle or large river and sap meaning fresh and not salty, is located north of Phnom Penh and is Southeast Asia’s largest freshwater lake during the rainy season. It can be as much as 250 km in length and 100 km at its widest point, stretching across the northwest section of the country from Siem Reap to the capital, Phnom Penh. Five provinces encircle the Tonle Sap, with about 3 million people inhabiting the banks, 90% of of which, earn their living by using the lake’s resources. The river, designated as a UNESCO Biosphere reserve in 1997, is where 149 types of fishes can be found. 11 of the fish species here are globally threatened and 6 of them are near-threatened. These include the spot-billed pelican, Bengal florican, Oriental darter, grey-headed fish eagle, greater adjutant and the Manchurian reed warbler. It has a notable reptile population such as the near extinct Siamese crocodiles, many freshwater snakes and the popular Mekong giant catfish, one of the world’s largest freshwater fish. Tonle Sap is the world’s 4th largest source of freshwater fish. Annually, fishermen can catch more than 400,000 tons of fish – about 75% of Cambodia’s freshwater fishing supply. Around 60% of the Cambodian population is directly relying on the river, not only for its fish supply, but also for fresh water and fertile sediments for growing crops along the Bassac, Mekong and Tonle Sap rivers. From June to November, the water from the Mekong river originating from the snow melt in the Himalayas combines with the monsoon rain in the SEA region. The result is an immense swelling in size, increasing it to a point wherein its outlets in the delta cannot handle the massive amount of floodwater anymore. Its reserves flow into the Tonle Sap River which is about 120 km in length, and once the river reaches its maximum capacity, the water enters Tonle Sap – the great lake, transforming it into a vast inland sea. The depth of the Tonle Sap can be as low as 3ft in the dry season and peaks to about 45m in September. Depending on the amount of the monsoon rains, the river can increase in size to as much as 10 to 15 times its regular size. This annual swelling of the lake also has a profound effect on the diverse fish and wildlife in the region. The “return of the river” phenomenon of the rainy season marks the migration of the Mekong giant catfish as well as other aquatic species to the great lake, where the flooding encourages the breeding and growth of huge fish stocks and other aquatic life. By November, when the monsoon ends and the dry season begins, the water pressure from the Mekong river subsides and the flow reverses back. The water flows again into the Mekong river, slowly draining the great lake. By February, Tonle Sap goes back into its original size, trapping the spawned fishes in the shallow pools of the drained lake and leaving fishermen with a bounty of fish and other aquatic resources to catch. The reduction in water level also leaves behind fertile sediments in the soil which then prepares the land for planting of crops. The shallow waters left after the flooding becomes a natural irrigation system used by farmers to produce a bountiful harvest. This significant occurrence, by virtue of its benefit to the people of Cambodia, is the reason why the Water and Moon Festival is widely celebrated. 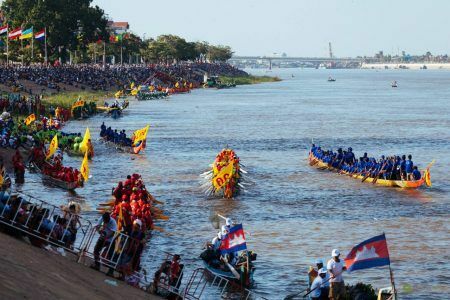 Aside from the boat racing, three additional ceremonies are showcased during the Cambodia Water Festival. The first is the Loy Pratip, an evening fluvial parade of illuminated colorful flotillas drifting up and down the Tonle Sap River, each one usually sponsored and decorated by Ministries and Government institutions. During the festival, celebrants’ light lanterns with offerings such as flowers, incense and candles which they then allow to float on the river. The biggest lantern is the Royal Lantern released at the riverside at 12 midnight of the full moon day. This is followed by a 30 mins fireworks display to welcome the full moon. Some Cambodians, especially in the provinces, still honor the tradition of making their own floats and releasing them into the water near their homes, believing that it may take the bad energy away from them. The second part is called Sampeas Preah Khe, also known as the salutation to the moon, and celebrated on the last day of the festival. Cambodians believe that the full moon brings good luck and they make sure to give thanks to Bon Om Touk as well as pray for a bountiful harvest. They set up an assortment of food, drinks and incense in front of their house before gathering at the pagodas to honor the third ceremony, the eating of Auk Ambok. Auk Ambok (flattened rice) is eaten at midnight after the salutation to the moon. Ambok, a holiday rice dish, is rice fried in the husk then flattened with a giant pestle before mixing with banana and coconut for flavor. Unlike Pchum Ben when the city inhabitants go back to hometowns to celebrate, Phnom Penh is the primary location of the Cambodia Water Festival celebrations. 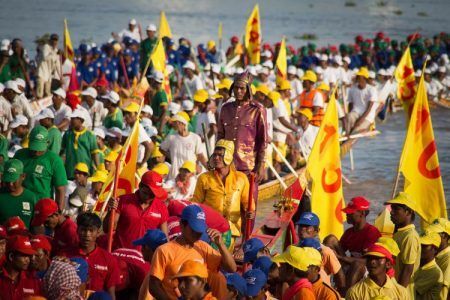 Villagers flock to the country’s capital during the festival to either participate in the boat racing competitions or take part in the festivities as onlookers and spectators. Activities include music concerts, traditional dancing, feasting on native foods, parades and brilliant fireworks lighting up in the sky at midnight. Schools and majority of the establishments will be closed for the holidays, allowing for a maximum number of people to participate in the festivities. The yearly water festival attracts thousands of tourists that boosts the tourism economy and villagers from provinces arrive en-masse gathering in the banks of Tonle Sap. The Sisowath Quay, stretching from Wat Phnom to Independence Monument is closed to motorists, accessible only to foot traffic. For 3 days, the capital is transformed into a carnival-like atmosphere where upwards of a million Cambodians and foreigners converge on the riverbanks to watch and cheer for their favorite teams, food and drinks overflowing in the streets from stalls that springs up for the holidays, and Khmer pop bands entertaining the crowd. In the evening, the celebrations continue on with carnival rides, brightly lit boats floating in the river, loud music, partying and fireworks. The Water and Moon Festival is rightly one of the most famous holidays in Cambodia. With holiday discounts, delicious traditional food, and a generally happy crowd, it’s not surprising why it attracts throngs of people. During this time, establishments enjoy the boost of profit it brings to the city as hotels are fully booked and street stalls pop up overnight. Properties along the Sisowath Quay boasts of being in the center of all the action, with investors enjoying the income it generates from the holidays and apartments in the area becoming more attractive. With this celebration in mind, plus the daily breathtaking view of the riverside from your balcony, it is no wonder that many still choose to live in this part of the city long term. Want to check out more Cambodian Holidays, click here.